The Health Wrap is back for 2019! As a way of easing readers back into work I thought I would do a round up of what happened while you were on holidays. A good place to start is with a call from Leanne Wells (CEO of Consumer Health Forum) for ten reform to-dos for a healthier 2019. It’s a great guide for what we might hope for in the health policy space in the year ahead. What would you add to her list? And what can we all do to improve the chances that this wish list becomes reality? MBS Review recommendations – will these reforms see the light of day? Just before Christmas the Morrison Government released, without fanfare, a pack of draft reports, covering a number of topics, from the Medicare Benefits Schedule (MBS) Review Taskforce. These recommendations now require stakeholder feedback which is then considered by the MBS Review Taskforce. If endorsed, it must then be considered by the Health Minister and the Government. It appears that there is no mechanism for comments on the reports to be made public; this lack of transparency is antithetical to public input. What is impressive about all the reports is the attention to the concerns and needs of consumers and patients and the need to address out-of-pocket costs, the wide-ranging expertise of the clinical committees, and the push to modernise the Medicare Benefits Schedule in line with best practice, up-to-date evidence and the time that is needed to actively involve patients as partners in the management of their care. 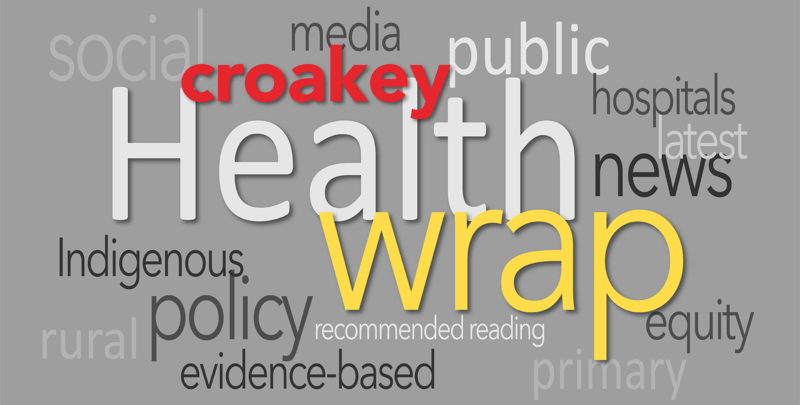 I wrote a detailed analysis of the recommendations from the General Practice and Primary Care Clinical Committee for Croakey; I concluded that the recommendations were a very good starting place for needed reforms around the management of chronic conditions. Ideally I would want to see a more dramatic move away from fee-for-service and more attention paid to integration of physical and mental health services – but what is recommended are appropriate small steps on the road to reform. I’m particularly taken with the proposal for a voluntary enrolment fee with a specified GP or practice and the benefits that could flow from that. Jennifer Doggett and I have previously put such a proposal forward as part of a set of solutions for addressing OOP costs. Just last week Jennifer tweeted about the problems confronting sick, frail elderly people who must make a face-to-face visit to their doctor for the renewal of a long-time prescription. Now there’s a recommendation to address that, through a recognised doctor-patient relationship. It’s easy to see that this approach will be antithetical to the Luddites in organised medicine. As Professor Stephen Leeder wrote last year; “what will happen when the tincture of iodine hits the hip pocket wounds created by the rationalisation of the MBS?” This Croakey report about the response to the preliminary 2016 report from on GP items gives some indication of what Leeder was referring to. My fears for the fate of all the work in all these reports is that the Health Minister of the day will hear only the complaints from the usual loud voices in medicine and will be backed into a corner where no decisions are made and reforms never eventuate. Indeed this has already happened, as the anaesthetists have lashed out against the MBS Review recommendations for this specialty (made by a clinical committee that included seven practicing anaesthetists) and Hunt has given in to their demands. It’s worth reading the scathing response from Professor Peter Brooks to this; he says, “if the medical profession cannot control the fees they charge then surely we should be pushing for a Royal Commission into medical fees to get things right once and for all.” That should set the cat among the pigeons! In late November the Government issued the terms of reference for the Productivity Commission’s inquiry intothe role of improving mental health to support economic participation and enhancing productivity and economic growth. An issues paper on the Social and Economic Benefits of Improving Mental Health was issued on January 21. Submission to the inquiry and comments on this paper are due by April 5. Some of this work has already been done, so there is sense in which the PC report is an unnecessary repeat. Last May KPMG and Mental Health Australia released a report Investing to Save which looked at the economic benefits for Australia of investment in mental health reform. It found that mental ill-health costs the economy some $60 billion per year, and dramatically affects workforce participation rates. It makes recommendations that would generate between $8.2 billion and $12.7 billion in savings from an investment of $4.4 billion. In a similar study done in 2014, PwC found that Australian companies could see a return of $2.30 on every $1 they invested in workplace mental health strategies. It is estimated that just a 25 percent improvement in mental health outcomes could boost GDP by one percent. The issues paper states that: “This inquiry will not be duplicating the work done in many past reviews to identify the structural weaknesses in existing models of healthcare for people with a mental illness” on the basis that the problems are well known, even if governments have struggled to deal with them. Multiple inquiries have noted the fragmented nature of mental health services, inadequate funding levels, the focus on acute care at the expense of community-based care and support, and unequal access to care. Perhaps governments will be challenged to do the hard work in reforms when they really understand the social and economic costs of mental illness? Time for the bean counters to start paying attention to healthcare policy! Incidentally, as an aside, here’s a health policy issue that needs addressing urgently: mental heath issues are the most common reason for a GP visit. Yet this is not reflected as a priority in medical training, in the workforce structure of medical practices, and in Medicare funding. Somehow the MBS Review managed to make an otherwise comprehensive set of recommendations for the better management of chronic conditions in general practice and primary care without any reference to mental health. Sigh! The MRFF appears to be severely underfunded when compared to the Government’s initial commitments. To date, the MRFF has given out less funding than promised, but significant long-term commitments mean that the majority of future funding is already directed. Some MRFF funds have been allocated outside of the Australian Medical Research and Innovation Priorities established by the Advisory Board by Government/Ministerial fiat, perhaps for political purposes. It appears that the Health Minister has yet to make publicly available the required biennial report on the financial assistance provided to medical research and medical innovation from the MRFF for the period in which the 2016-18 Priorities were in effect. There needs to be a dramatic increase in transparency around the aggregation, management and distribution of these funds so that taxpayers can see where and why the funding, much of it clawed back from important healthcare and Indigenous programs, is invested. Croakey has asked the Health Minister’s office to respond to this article, but as yet has heard nothing. Interestingly there has also been no response from the research organisations, whose own analyses show that the MRFF is underfunded. The Democratic Republic of the Congo is experiencing an Ebola virus outbreak that was declared as such in August 2018 and is raising concerns within the international community about its potential to spread. These concerns are heightened following recent reports that Ebola has reached Mbandaka, a city of nearly 1.2 million people. The outbreak is the second-deadliest and second-largest in history, topped only by one in West Africa in 2014, when the disease killed more than 11,000 people. But it appears this outbreak is worsening. This week the DRC confirmed 14 new cases of Ebola in its eastern borderlands, the largest one-day increase since the current outbreak was declared. In all, the haemorrhagic fever is believed to have killed 439 people and infected another 274 in the eastern provinces of North Kivu and Ituri. Health officials have struggled to bring the current outbreak under control because widespread militia violence in eastern Congo has hampered the response. So far some 65,200 people have been vaccinated with the new vaccine which appears to be effective. Vaccine manufacturer Merck has shipped over 100,000 doses to the World Health Organisation and is looking to stockpile 300,000 more doses. Public health efforts to prevent Ebola are hindered because researchers don’t know what animal or animals carry it, much less how it spreads to people. Bats have long been suspected of being a natural reservoir or animal host for Ebola, and just this week, for the first time, the virus was found in bats in West Africa. Brisbane virologist Dr Ian Mackay reports on this crisis regularly on his website Virology Down Under and his twitter feed @MackayIM . The WHO posts regular updates on its website. There’s an election coming – but will the spending welter deliver needed reforms? Even if you didn’t know there was a federal election scheduled for May, you might have guessed something was up by the rash of health funding announcements from politicians. So far this month the Coalition has made announcements of health and biomedical research funding amounting to $1.74 billion. Labor’s announcements total $146 million. $1.45 billion for mental health services delivered by PHNs. This announcement is both good news (funding was due to expire June 30 and a new funding process offers greater funding certainty into the future) and not so good (the 3-year allocation is an increase of only $170 million over the previous funding level). $45 million for headspace. This bring the total investment in headspace to more than $208 million since October 2018. It is possible that this funding is also included in the $1.45 billion above. $25 million from the MRFF for a new Drug Discovery Centre at Walter and Eliza Hall Institute. $27 million to the McGrath Foundation for breast cancer support. $12 million for a mobile cardiology service in North Queensland. $60 million for Stage 1 of the new Cairns University Hospital. This commitment is matched by Labor. And in a sign of where politicians’ will continue to (misguidedly) focus their campaigning, after his original announcement, Opposition Leader Bill Shorten upped the ante by promising $15 million to redevelop the Cairns Hospital Emergency Department. Many of the other Government announcements were for new medicines on the PBS and research projects in a variety of areas. Some of these were repeats of NHMRC funding announcements made late in 2018. $50 million for Type 1 diabetes research. $21 million for a new Monash – Peninsula Health Future Hub. $60 million+ $15 million for Cairns hospital infrastructure. I note the Government has funded a $10 million advertising blitz for bowel cancer screening and provided $3 million for a digital alcohol harm reduction program. But we must all wait anxiously for signs that this spending blitz will turn from hospital beds, research and new drugs to prevention, public health, and tackling inequalities. I’ve decided that – as a counter to the dreadful political environment (and I worry about bad politics on two continents) and the Trumpification of the world – I will conclude each edition of The Health Wrap with a good news story. I invite you to contribute to this effort. Today’s story isn’t just good news, it’s important news that verifies what we always knew about healthcare – that caring matters. An article this week in the New York Times based on a study published in the Journal of General Internal Medicine, looks at the impact of doctors’ words on their patients’ health. The study looked at the effect of physician assurance absent pharmacological treatment – in this case, a simple sentence in which physicians told patients their symptoms would diminish – on patient allergic reactions. It’s a form of placebo effect, but absent even an inert treatment. As you ponder this you might also enjoy two pieces from me on the power of the placebo effect and the everyday heroes of medicine.